“Who says Black Friday is dead?” said Phil Wahba in Fortune.com. Nearly 174 million Americans went shopping either online or in person over the long Thanksgiving weekend, “far more people than expected and a promising start” to the holiday sales season that is the lifeblood of the U.S. retail industry. For the third year in a row, more shoppers opted to fill digital shopping carts from the comfort of their couches: Some 58 million people chose to shop exclusively online this year, compared with 51 million who headed to the mall to scout deals. Another 65 million shopped both online and in stores. And early indications suggest people opened their wallets wide. Black Friday digital receipts alone came in at a record $5.03 billion, a nearly 17 percent increase over last year. Many of those who did trudge to the mall did so “less for the deals than the tradition,” said Lauren Zumbach in the Chicago Tribune. Ester Castano headed out at 3 a.m. on Black Friday with her sisters and mother in suburban Chicago because that’s what they’ve done every year for a decade. “It’s something we can do as a family,” she said. Writing off Black Friday as a retail relic never made sense, said Eliza Brooke in Racked.com. It’s just evolving with the times. 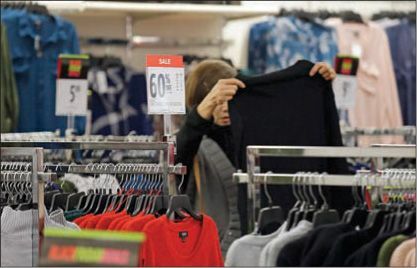 “Gone is the single adrenaline-fueled day of shopping, replaced by a steady flow of deals that shoppers can access at their convenience.” In one sign of how competitive the retail landscape has become, many stores kicked off sales the Monday before Thanksgiving, and some even earlier, leading analysts to rechristen the event “Black November.” These longer periods of deep discounts are something consumers can expect in the years to come. And to retailers’ delight, they were rewarded with high-spending shoppers. The biggest spenders were Millennials, who forked out $419.52 on average over the weekend, when spending across all age groups was $335.47 per person. If this year is any indication, digital shopping is only going to grow in importance, said Lauren Thomas in CNBC.com. Cyber Monday 2017 is “going down in the history books” as the largest online shopping day in U.S. history, with a record $6.59 billion in digital sales. That’s a 16.8 percent increase over 2016. Mobile shopping also had a landmark day, with a record $2 billion in sales taking place on smartphones.